Time again for Monday’s Music Moves Me, otherwise known as #4M or M4, depending upon whom you are conversing with. Today’s Theme is a freebie, so I decided to continue on with the self-indulgence (see Battle of the Bands post) theme. Today, I have a few more songs with ‘Mary’ in the title. I’ve come up with 10, although I know there are more out there. What is one of your favorite songs about Mary? Do you have a favorite song with your name in it? I got the idea for this when I was working on the original 'songs with names in it' (that post will now be busted up and broken into a few more posts as the theme changed to be a bit more specific) It just sounded like a lot of fun. Thanks for stopping in to say hello! Hey Mary. It's Mary Day today! Girl, where do you find all these bands? I never heard of half of them! As for the new-to-me songs, I really like the Scissor Sisters one and also Kip Moore's "Mary Was the Marrying Kind." And I gotta say, I really like Taylor Swift. I've always been so dang impressed with that girl. She is incredibly talented as both a singer and a songwriter. So wealthy at such a young age, all self-made. Impressive! 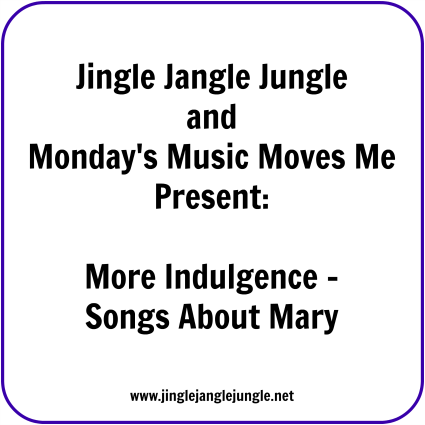 I had Tom Petty's "Mary Jane's Last Dance" in my post last week. That has to be one of the most disturbing videos ever! It creeps me out. And it won an MTV award for Best Video or something like that. Crazy creepy! I love the Association's "Along Comes Mary" -- they were cool performers. Have you ever seen the beginning of that TV appearance that you posted? It's creative. GREAT stuff here today Mary! Thanks for the introduction to so many new-to-me bands and songs. Where do I find these bands? Let me tell you, Google can be your best friend :) So many that I had not heard of, but wanted to share. I love it when I find something new. It kind of freshens up the place, don't you think? Thanks for stopping by for the dance! And to think that this is just a mere sampling! There are quite a few more out there. Great songs. Thanks for sharing. Glad you enjoyed it. Appreciate you stopping by! I have to go with Rick James since I am big fan! I also like Kings of Leon so it was a tough choice for me. Who knew there were so many songs with your name in it! Whoa, I cannot believe I don't know a lot of the Mary tunes, but thanks for the introduction. Not bad! The vaudeville one is totally funny, loved it!! I love old movies. Who doesn't like Creedance Clearwater woo hoo! Taylor Swift had to be super young for that tune still doing country. The next ones are unfamiliar, but great listening tunes. 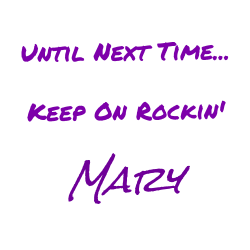 My hubby does the Tom Petty tune in his band.. and I think everyone has heard Along comes Mary... huh? I remember singing that one in the car!! hahaha That was fun! You rocked the house girlfriend! GREAT JOB! glad that I could introduce you to some new tunes! Awesome work.. i really enjoyed. My favorite aunt was named Mary. I so love The Association but I also love CCR this is a hard one. What about "Mary, Mary" by The Monkess (and the Butterfield Blues Band)? No matter, love your choices! I had left out Mary Mary because that was my latest battle. Otherwise, at least one of the three versions would have been on the list. Thanks, Angie! This was fun to put together! Fun! I only knew a few of these. Good work. It was fun finding new to me songs. Happy to share them with you. Here I am, five days late and $1,192.00 short. I didn't know all these, but the ones I did (CCR, Tom Petty, The Association), I like. The first one I think of is MARY, DID YOU KNOW? This was a fun exercise and I found quite a few that I hadn't known about either.